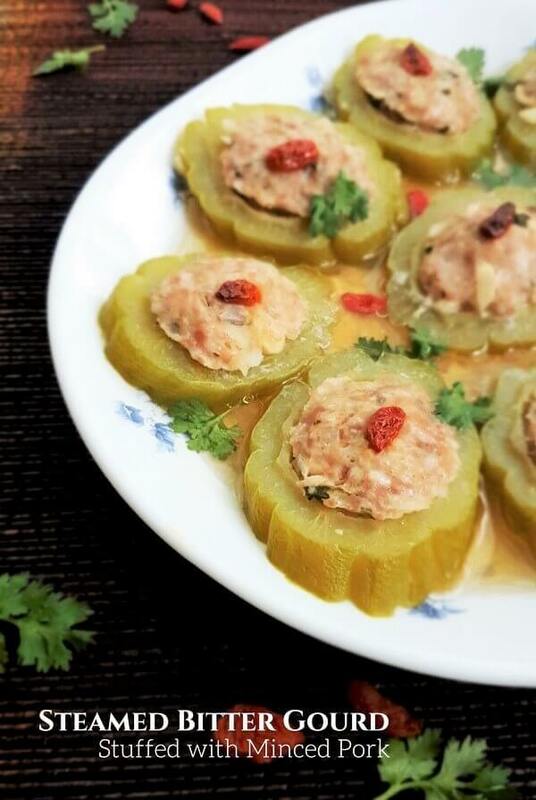 A dish of Hakka origins, stuffed bitter gourd is also loved by other dialect groups. 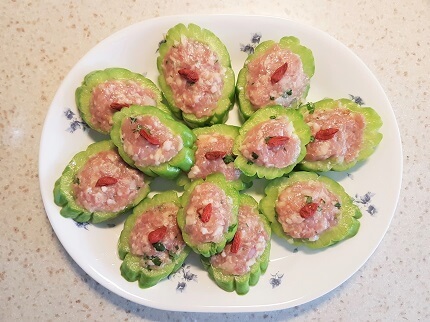 This stuffed bitter melon recipe has become a favourite of mine and it reminds me very much of yong tau foo where bitter gourd slices are also stuffed but with fish paste instead of meat. A nutritionally rich vegetable-fruit, bitter gourd is something you either love or hate. As its name implies, it is bitter tasting and typically an acquired taste for the uninitiated. For me, I only learned to like it when I was an adult. This underrated gourd can be enjoyed in so many ways. Bitter gourd, also known as bitter melon, 苦瓜 (kŭ guā) or karela (in India) can also be stir-fried, braised, boiled, steamed, pickled, roasted, juiced, cooked with curries, scrambled with eggs, etc. There’s also bitter gourd tea and capsules. Isn’t that amazing? In addition to being a food ingredient, bitter gourd is also known to be highly beneficial to diabetics. This is due to a chemical called charantin which has hypoglycemic effects. In an article by The Open Medicinal Chemistry Journal in 2011, it was reported that M. charantia contains insulin like properties. Results from tests showed that it can regulate how much glucose is absorbed by the gut and stimulate glucose uptake just like insulin. Traditional Chinese medicine considers indigestion as one of the causes of diabetes. As bitter gourd is able to remove heat toxins and stagnation from the digestive system, thus it can help reduce the symptom of diabetes. Along with exercise, choosing the right type of food to eat is important to help manage diabetes. Bitter gourd is one of these foods. You can’t remove the bitter taste entirely. At least not from my experience. If you want to remove the bitter taste completely you might as well not eat bitter gourd. But you can try to tone it down. Personally, I don’t mind the bitter taste but I know many are repelled by its bitterness. My late mom used to rub salt all over the gourd and set it aside for awhile before draining the juice and rinsing off the excess salt. I tried this method too but the bitter taste is only reduced by a little, if at all. Perhaps I should have given more time for the salt to work its magic. But I don’t have the patience to wait. A quick search on the internet show some articles recommending squeezing out as much juice as possible from the bitter gourd after the salt treatment. I didn’t follow that method to avoid breaking the bitter gourd rings and loss of nutrients. Soaking the bitter gourd in salt water for 15 to 30 minutes. Soak the bitter gourd in tamarind water for 30 minutes. Strain and rinse. Blanching the bitter gourd in boiling water for about 2 minutes. To offset the bitter taste, I added chopped water chestnuts (马蹄) to the meat paste. They balanced the bitterness and provided a crunchy texture at the same time. My Piggy commented that they look like rocks in this picture. Lol! 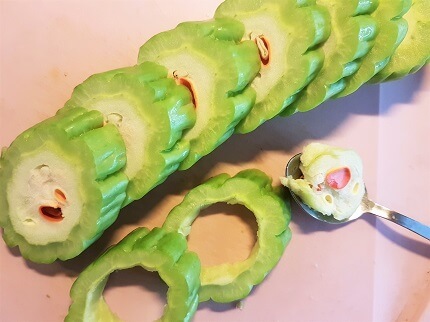 Slice the bitter gourd into 1 cm rings. You can slice them diagonally like I did or straight cross wise. Then use a spoon to remove the white spongy part. I added a goji berry (枸杞子) on top of each bitter gourd slice. Not just for aesthetic purposes, they also add a natural tinge of sweetness to this dish. You can also include them into the meat paste if you wish. 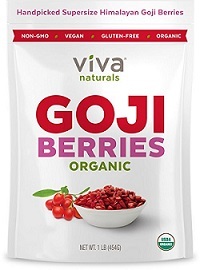 Goji berries are good for your eyes, skin and immune system. It contains vitamins B1,B2, B6, C and E among a host of other health benefits. I love to add them into steamed dishes such as this Steamed Chicken with Black Fungus and also soups. Steam the bitter gourd with a wok/pot and steamer. Pictured below is my trusty wok and steamer which I’ve been using for a decade now. If you don’t have a steamer, you can also place the plate on a trivet to steam which is what I sometimes do. The longer you steam, the softer the gourds will be. 20 minutes was just nice for me. Too long and it’ll turn mushy. You can also use this recipe to stuff dried shiitake mushrooms, tofu, chilies, etc. The broth from the steamed bitter gourd was good to the last drop. The steaming process infused all the flavors into the broth making it delicately sweet and subtly bitter all at once. Savor the juicy and delicious meat as you bite into each slice. Once you begin to like this vegetable, you’ll savor and appreciate its bitterness. As the Chinese adage goes, people who can 吃苦 – chīkŭ (literal translation: eat bitter) are able to endure hardships. How do you like to cook bitter gourd? Share with me on the comment box below. Don’t want to miss a recipe? Sign up for Souper Diaries newsletter delivered to your inbox! Connect with me on Facebook, Instagram, Pinterest, Twitter and Google+ for all the latest updates. Thanks for reading and happy cooking! 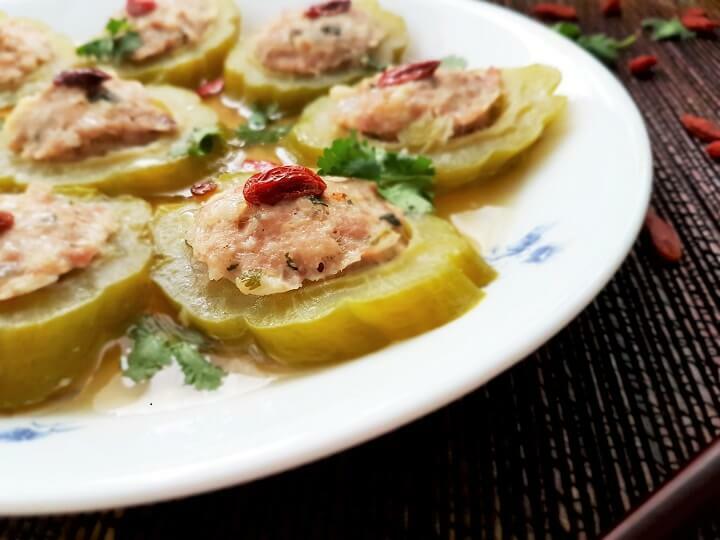 A classic and healthy Chinese dish of steamed bitter gourd stuffed with minced pork. The addition of water chestnuts and goji berries add natural sweetness and crunch to the meat paste. The steaming process infuses the broth with a delicate bitter sweet taste. Rinse bitter gourd and cut into 1 cm thick rings. Remove seeds and white spongy part with a spoon. To reduce the bitter taste, sprinkle salt liberally on the bitter gourd rings. Mix well and let stand for 30 minutes. Drain away juices. Rinse 2 - 3 times and set aside. If you don't mind the bitter taste, skip this step and proceed to step 3. Meanwhile, combine minced pork with the chopped red onion, water chestnuts and seasonings. Mix well with a spoon or a pair of chopsticks. Stuff the bitter gourd cavities with the minced pork mixture making sure there're no gaps. Let the meat bulge a little. Smooth the paste with the back of a spoon. Place 1 goji berry on top of each stuffed bitter gourd. Scatter some on the plate. Arrange the bitter gourd rings on a heatproof plate. Drizzle with ½ tbsp of fried shallot/garlic oil. Bring water to a boil in a wok. Put the plate on a steamer and place it on top of the wok. Steam on medium-high heat for 15 minutes OR 20 minutes if you want the bitter gourd to be softer. Don't steam for too long or the bitter gourd will become mushy. Turn off heat and remove from the wok. Garnish with coriander leaves and serve immediately. 1. If you don't have a steamer, you can also place a trivet on the wok and carefully lower the plate on the trivet when the water comes to a boil. 2. Depending on how much meat you use to stuff each bitter gourd, you may have some leftover meat. Suggestion: Use them to make meatballs and steam them together with the bitter gourd rings. Hey Yvonne, I’m so glad you posted this recipe! I just recently bought some 苦瓜 (bitter gourd) from the supermarket and I was thinking to try a vegan version of this exact dish (with some vegan sausage I recently learned how to make)! I asked a Hakka friend of mine how her mom cooks the dish because i actually had some at her home before… so I was just looking up the steaming time for this vegetable! Amazing that I came across your article/recipe! Thanks for posting it! The recipe looks great and as I am a great fan of all styles of Asian cooking could be very keen to give it a try. Just out of curiosity though; Say I am preparing a meal for friends and wanted to try this recipe, is there a similar vegetable you could recommend as a substitution as another option for people attending who may not like the bitter flavour? Yes, you could use this recipe to stuff reconstituted dried shiitake mushrooms, tofu, chilies, etc. 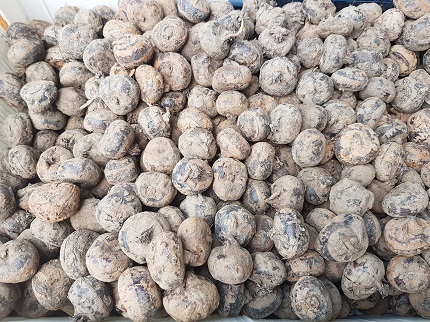 Btw, if you can’t find water chestnuts, you can omit that. Let me know if you have further questions. I’ll be back to try more of your other recipes too, I love Asian and Chinese food! I often try to sharpen my skills at home using a DISCADA. I used to loathe bitter gourd when I was little but now I’m beginning to appreciate it more. Another gourd recipe you may want to try is this Braised Chicken with Bitter Gourd. I’ve not cooked with a discada before but it does look quite similar to a wok. 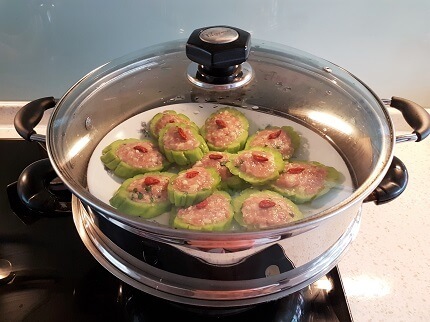 I would appreciate your feedback on how this Steamed Stuffed Bitter Melon recipe turns out for you! Great recipe Yvonne! I never heard of Bitter Gourd before. It’s cool to see it helps with Diabetes. I’ll have to look for it next time. Thanks for sharing this recipe! I was doing some research on some low-carb healthy recipes because I am trying to cut back on carbs and eat healthier. I will be trying this recipe very soon. Do you have any low carb dessert recipes that you suggest for those sweet cravings? Hi there Yvonne. I was looking for some recipes for diabetics, as I’m struggling with a high sugar level and came upon this stuffed bitter melon recipe. I tried it and it tastes GREAT! I will definitely make this again and again and again. Thank you so much! I’ll be testing some of your other recipes too! I used to hate bittergourd when I was younger. But since I knew how good is it for our health and there are ways to turn it into a delicious dish, I changed my mind or my taste to be exact. Looking at those pictures reminded me of a homecooked bittergourd minced pork that my mom prepared recently. It’s awesome. Anyway, I prefer minced pork to the fish paste version but I’ll do with both anytime. I’m glad to hear that you like bitter gourd now. It also took me a long time to acquire the taste for it. I love both the minced pork and fish paste version. Yum, this looks appealing and my parents have a load of Bitter Melons growing in their backyard. I think it’s about time the taking them from the garden and onto the dinner table. Great recipe idea and I would love to forward this on to my mum. So, I can make her cook it for me. Awesome site and it has given me a lot of great ideas! I’m not too much of a cook, but love to eat. Your meals look delicious enough to eat right off the photo. You’ve done your research well in regards to putting together tasty meals. I’m trying to eat more healthy nowadays, and it seems like you’ve taken care of that quite well in regards to presenting healthy dishes. Nice recipe! Very different from other recipes. How long does this take to make? It seems complicated but I like trying new things! The preparation time and cooking time is on the recipe. Steam the stuffed bitter gourd for around 20 minutes. Too long and they will be overly soft. The extra 5 minutes was the time for the water to boil. It’s quite an easy recipe to follow. Do try it out and let me know how it goes! Thank you for your beautiful recipe, I love the photos and I get appetite immediately! I won’t be able to cook it because I have never seen such a vegetable. Looks a little like cucumber, but I am sure it is quite different. More like zucchini? Anyways, I love stuffing vegetables like peppers, zucchinis and eggplants, so I can use your recipe for that! I love bitter melon so much. Other people may think it’s hard to deal with, but this is my favorite, not saying that it’s so nutritious and healthy as well. This also seems like the dish my mom usually makes. Now, I can do it on my own. Thanks for sharing this! I will bookmark your website for sure! I agree. Most people do not like the taste of bitter melon and it is something of an acquired taste. Which is a pity as bitter melon has so much nutrition and helps to lower blood sugar in our bodies. And you can cook it so many different ways. 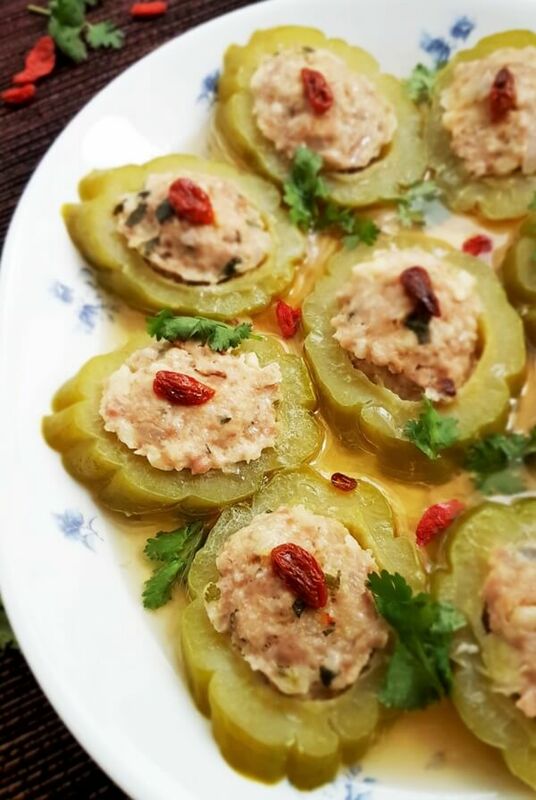 Do try this steamed stuffed bitter melon recipe and share this post with your friends. Thanks! I’ve heard about bitter melon before somewhere but I can’t quite remember where it was. I think it was on a TV show or something. But I thought that it didn’t seem too appetizing. It’s interesting that it is good for diabetics because it lowers blood sugar. I’ve also heard the same thing about fenugreek. I wonder what would happen if a diabetic was to have both bitter lemon and fenugreek. Do you think their blood sugar level would drop too low? You’re right. Many people do not find bitter melon appetizing as the taste is bitter. It is an acquired taste but I hope that won’t deter you from trying it. 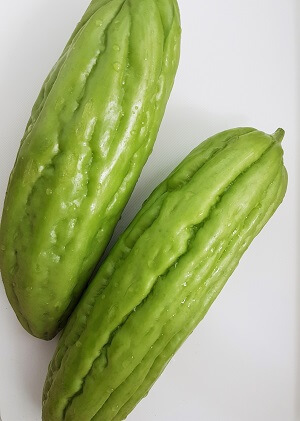 Apart from helping to lower blood sugar, bitter gourd also contains vitamins such as vitamins C, A, B and minerals such as iron, zinc, potassium, manganese and magnesium. It is really delicious when cooked right. 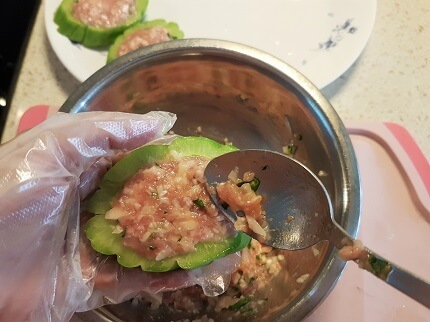 This stuffed bitter melon recipe is one of the many ways one can cook bitter melon. I’ve not tried mixing fenugreek with bitter gourd before and I’m not sure if their blood sugar would reduce too low. It is better to check with a doctor or healthcare provider before making any changes to a diabetes management plan.